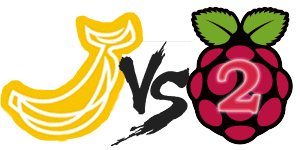 I used a Raspberry Pi and Pi 2 both running Minibian and a Banana Pi running Bananian. No devices were overclocked, so the table reflects the speeds used in these tests. 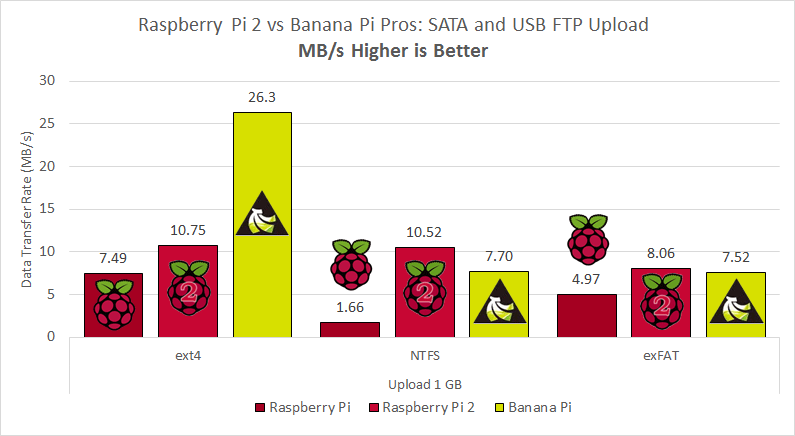 It is important to note that the Raspberry Pi and Pi 2’s ethernet and USB share the same bus which impairs performance. 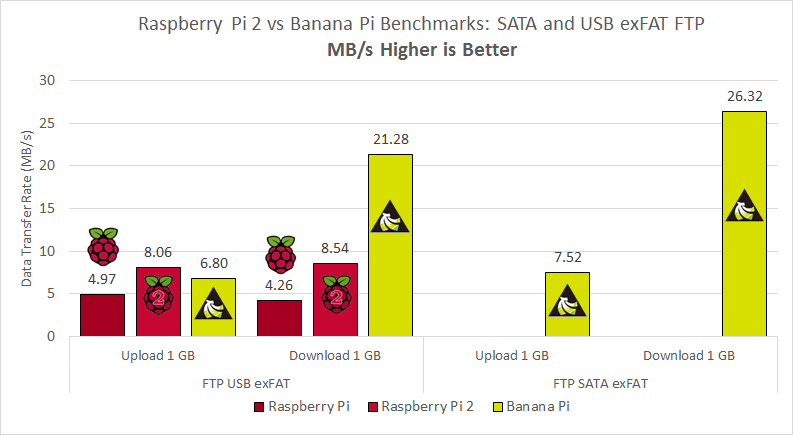 Also the Banana Pi’s gigabit port is limited to 470 Mbit. 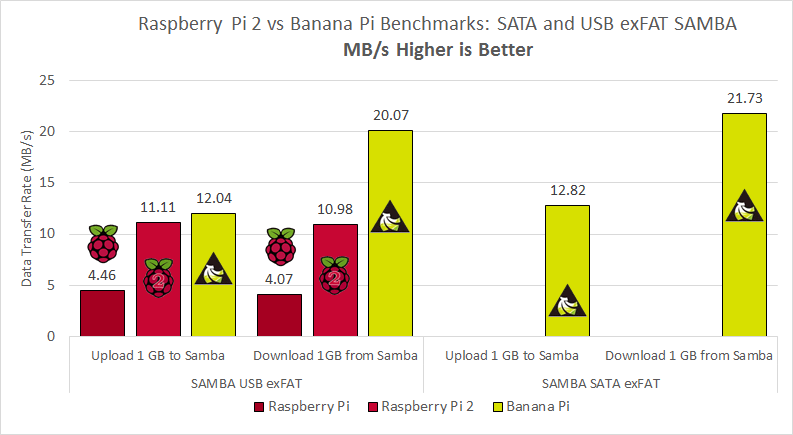 The same 160 GB 7200 RPM 2.5″ Hard Drive formatted as ext4 used in my other benchmarks along with a Banana Pi SATA Cable was the storage device in all tests. The hard drive was formatted with ext4, NTFS and exFAT. The current NTFS-3G and exfat-utils were installed from the Debian Wheezy repository. Current versions of vsftpd and SAMBA were installed from the Wheezy repositories as well. I used robocopy for copying SAMBA files and FileZilla to transfer via FTP on an Alienware m14xr2. 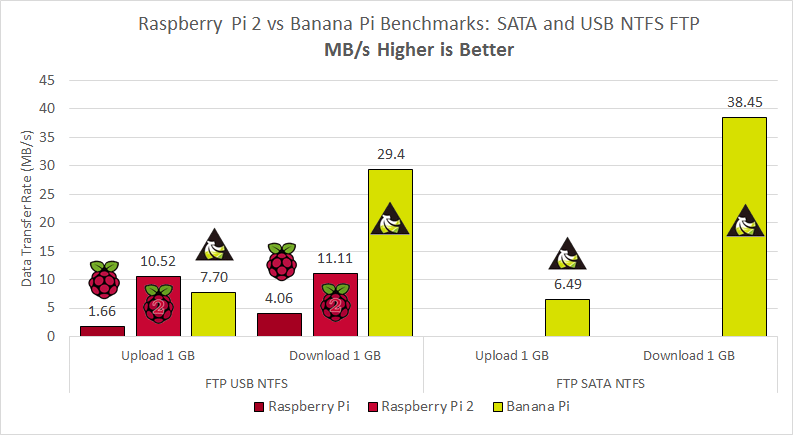 The SATA benefit here on the Banana Pi is clear, ftp requires very little CPU overhead so maximum speeds are achievable on all devices. Furthermore using the native file system ext4 means even less overhead. 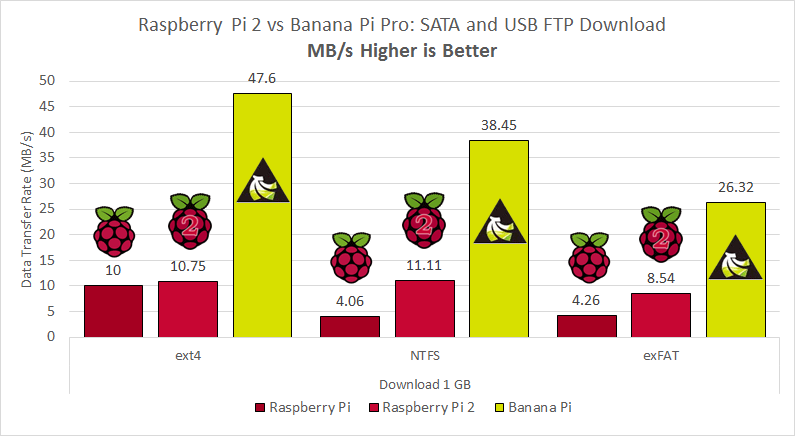 The NTFS-3G write driver underperforms because it is very CPU intensive, this is why the Pi 2 can beat the Banana Pi because the Pi 2 has 4 cores compared to the Pi 2’s 2 cores. 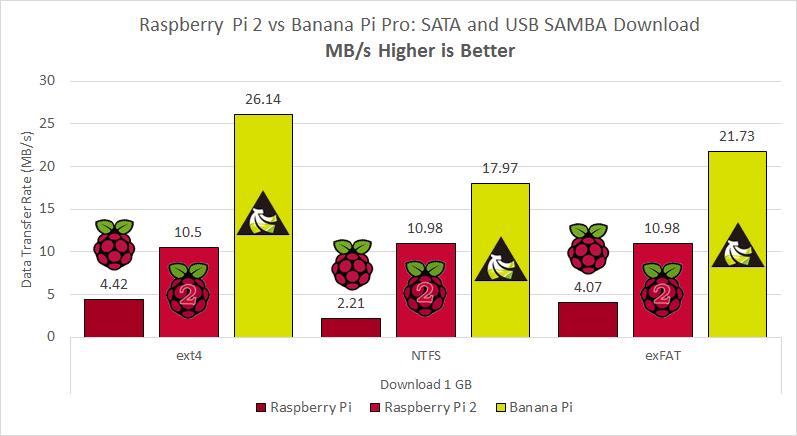 The NTFS-3G read driver is clearly more efficient allowing better performance and the benefits of SATA become clear. 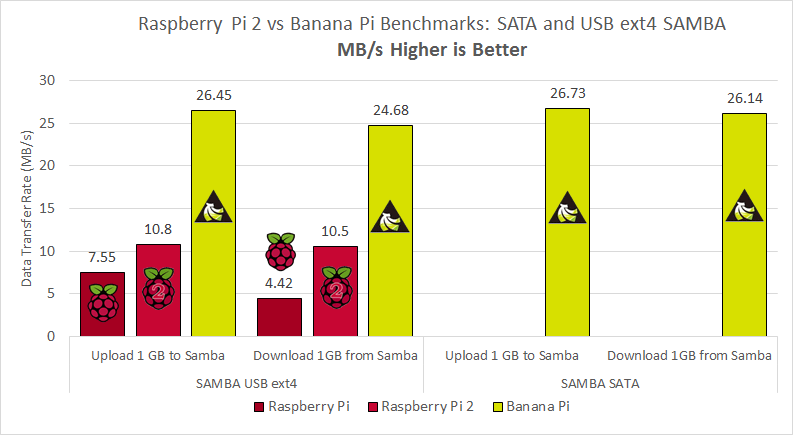 These benchmarks comprehensively compared file sharing over a network using the file systems ext4, NTFS and exFAT over FTP and SAMBA shares with the Raspberry Pi, Pi 2 and Banana Pi. 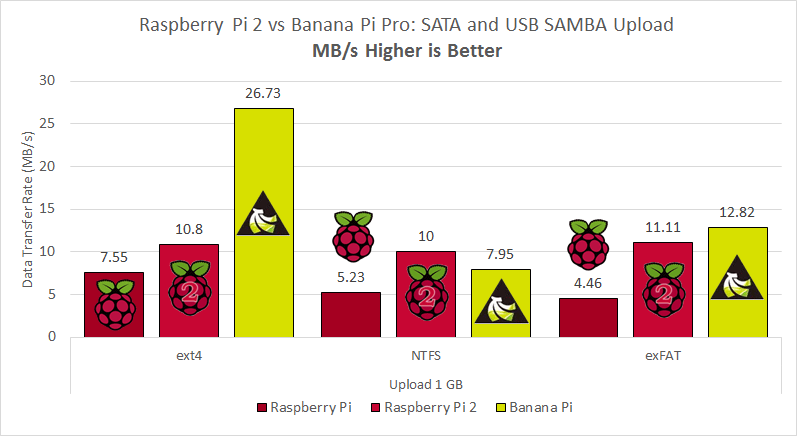 Unsurprisingly, ext4 the native Linux file system had the best performance over FTP, SAMBA nearly halved the data transfer rate on the Banana Pi indicating a large CPU overhead. As I have mentioned in other benchmarks, using FTP to access media files is ideal and can be done using Kodi (XBMC) based media centers. FTP will always be preferable to SAMBA for transfers so I would recommend only using SAMBA for convenience to delete and manage files rather than large transfers. In general the write drivers for foreign file systems are slower than the read drivers. You are better off transferring via FTP for maximum speed, again SAMBA should only be used to do minor management rather than large transfers. NTFS and exFAT could be useful for users that already have their media stored on such a file system and do not have the equipment to migrate to ext4 or they want to keep it as NTFS or exFAT so it can be easily read by Windows machines. It is important to not only think of the significance of transfer rates, some people on reddit have mentioned that streaming media does not always require that much bandwidth. 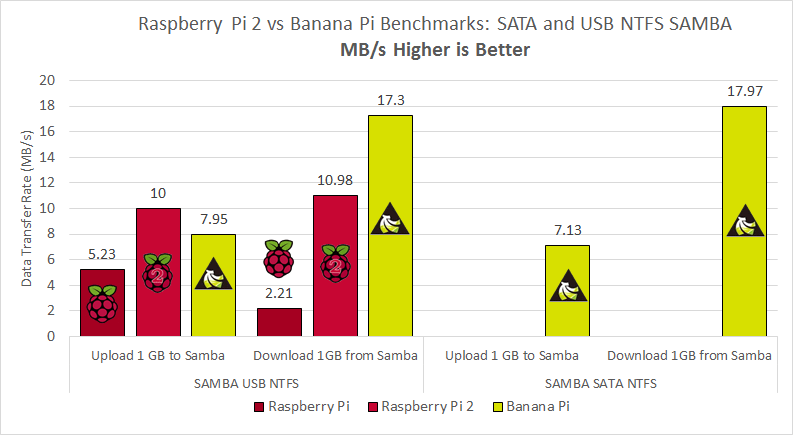 However, the CPU overhead from using foreign file systems like NTFS and exFAT combined with SAMBA may be significant. Unfortunately, I did not record CPU usage for these tests so it may just be the drivers that need optimizing. If anybody has suggestions for automating the CPU usage so I can get accurate data please leave a comment or use the contact form. I am looking forward to a Raspberry Pi model that at least includes gigabit. I am looking more forward to testing the Orange Pi Plus which should be here any day now which sports a quad core 1.6 GHz CPU with SATA and gigabit. 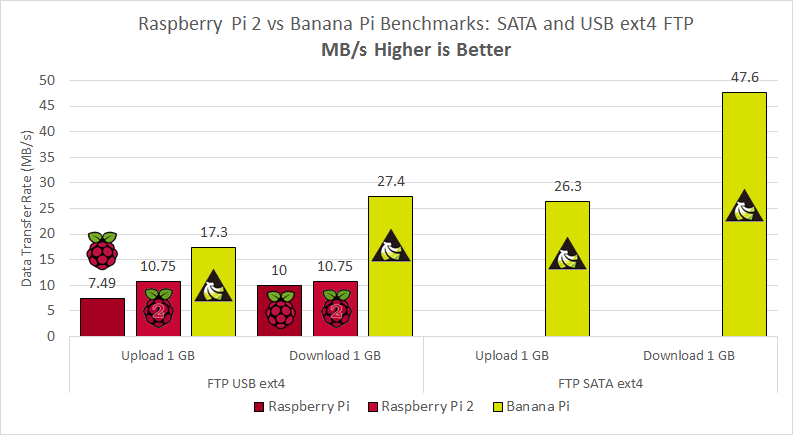 The Banana Pi crew will be releasing an updated model later this year which I expect to have 4 cores too.
. The Pro version includes 802.11n Wifi for those who are not wired for ethernet in their home.